A composite volcano is also known as a stratovolcano. These volcanoes form tall, conical shaped mountains. Most of the Earth's active volcanoes have formed a ring around the Pacific Ocean. There are 452 stratovolcanoes in the Pacific Ring of Fire. The volcanoes are located in a volcanic arc on the continental side of subduction zones. Stratovolcanoes are typically composed of layers of pyroclastic material. The layers that form the mountain are lava, volcanic ash, tephra, and pumice. Andesite, dacite and rhyolite lavas erupted by these volcanoes have a high percentage of quartz and feldspar minerals. The minerals in these lavas can be highly explosive because the gases in the magma cannot easily escape. The lava is less fluid and forms thick lava flows on the sides of the volcano. Sometimes the lavas form small dome volcanoes over the vent in the crater of a stratovolcano or on its steep sides. Stratovolcanoes erupt less frequently than shield volcanoes which have formed over hot spots. The lava is less fluid and often erupts with explosive eruptions that produce deadly pyroclastic flows. 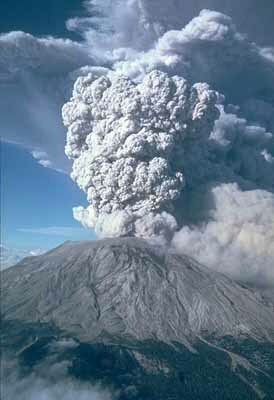 The eruptions of Krakatoa in 1883, Mount Saint Helens in 1980 and Mount Pinatubo in 1992 were examples of large volcanic eruptions by stratovolcanoes.